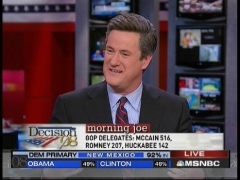 Joe Scarborough has given away the MSM's dirty big secret: it hates Mitt Romney and is letting that animus distort its coverage of the Republican race. Joe went on an impassioned riff at the opening of today's Morning Joe. JOE SCARBOROUGH: I want the media mavens in Manhattan and Washington, DC to listen what I'm about to tell you, because it goes against your narrative, but it is the truth. Look at the map; let's put the map back up there. Last night was a good night for John McCain, he won the big states . . . but starting at about 9 PM last night, before a lot of the Western states were closed, we heard over and over again that Mike Huckabee had now raced into second place, and once again friends that Mitt Romney should drop from the race . . . McCain had nine states won, Romney had seven states won, Huckabee had five states won. And yet, what did we hear time and time again, at this network and every other network: Mike Huckabee has now raced into second place. Here's a shocking thing, and I know it's going to stun a lot of people, and I hate to make a leap of faith here, but from where I come from, 207 [Romney's delegate count] is higher than 142 [Huckabee's ]. Now I am not being a smart aleck, but I can read numbers and the news media can read numbers, and if the news media looked past the end of their nose, and looked past the narrative that they wanted to tell, they would also bring up something else, Mika: they would bring up the fact that Mike Huckabee had a wonderful night last night, but the only other state in the Deep South, that is his home base, from now till the end of the process: Mississippi . . . I have to point this out time and time again: I am not in the tank for Mitt Romney. I am flabbergasted that people in the media are as blinded by hatred for one candidate. I know all the other candidates have said they hate Mitt Romney: it's everybody against Romney, and that's fine: they can hate him if they want. But the news media is supposed to report dispassionately. If they did, they would look at the future calendar and say this . . . as we move forward friends, right now, John McCain is not the presumptive nominee, but he is close to that. A couple of more big wins for John McCain and he will represent the Republican party this fall. But as we move forward, the states that are going to be on the calendar are states where Mike Huckabee will not be as strong unless he expands dramatically past his evangelical base. What does that mean? That means Mitt Romney finally has what Mitt Romney has wanted since Iowa: a one-on-one where the conservative runs against the moderate. One other thing that Mitt Romney has: money. Now if you look at the calendar, if you look at what's coming up in the future, you don't say that this is Mitt Romney's to lose. But you sure as hell don't say he should drop out of the race. We heard that Mitt Romney should drop out of the race after Iowa, after New Hampshire, after Florida. It continues, over and over again, and I'll be damned if we didn't hear it again last night. We've been beating this drum -- look at all the states the man won. He won Maine, he won Massachusetts, he won Michigan. He won all of those states; he's got the second most delegates; he's got the most money. And yet the media continues to scream: "drop out." MIKA BRZEZINSKI: Since you believe there's been this narrative against Mitt Romney, why do that hate him so much? BRZEZINSKI: I think they think he's a faux conservative. SCARBOROUGH: OK, well, the thing is, if you're in the media, and you think he's a phony, you put that on your editorial page. BRZEZINSKI: Well that has happened. WILLIE GEIST: I wonder if there is something to Romney's argument about him being the outside guy, and even in the media everyone knows John McCain, they know his story, they like John McCain, and whether that's translating over the airwaves in the analysis: I think there's something to it.